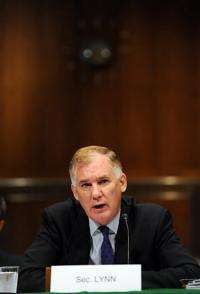 US Deputy Secretary of Defense William Lynn testifies in 2009. The most serious cyber attack on the US military's networks came from a tainted flash drive in 2008, forcing the Pentagon to review its digital security, Lynn said Wednesday. The most serious cyber attack on the US military's networks came from a tainted flash drive in 2008, forcing the Pentagon to review its digital security, a top US defense official said Wednesday. The thumb drive, which was inserted in a military laptop in the Mideast, contained malicious code that "spread undetected on both classified and unclassified systems, establishing what amounted to a digital beachhead, from which data could be transferred to servers under foreign control," Deputy Defense Secretary William Lynn wrote in the journal Foreign Affairs. The code was placed on the drive by "a foreign intelligence agency," Lynn wrote. Previous media reports speculated that the attack may have originated from Russia. The Pentagon had never openly discussed the incident, but Lynn chose to reveal the details of the attack as officials try to raise public awareness of the growing threat posed to government computer networks. The incident served as a wake-up for the Pentagon and prompted major changes in how the department handled digital threats, including the formation of a new cyber military command, Lynn said. After the 2008 assault, the Pentagon banned its work force from using flash drives, but recently eased the prohibition. Since the attack, the military has developed methods to uncover intruders inside its network, or so-called "active defense systems," according to Lynn. But he added that drafting rules of engagement for defending against cyber attack was "not easy," as the laws of war were written before the advent of a digital battlefield. they're just dumb for putting both together.. classified should never be on the same network as unclassified.. My dad works for a defense contractor, and their classified wires have to be 4 feet away from their unclassified ones. Everything classified can't be accessed via the internet. Stupid networking people over there. Most workplaces that are security savvy have major restrictions on flash drives. Sounds like WikiLeak rebels up to their tricks again. I hope Windows 8 has more security with artificial intelligence to make it easier to find keyloggers, etc.. "I am PC." haha they fell for the oldest "digital bait" in the book, leaving a flash stick in the parking lot of a military institution.human curiosity once again was the main hurdle. Like the old saying goes "Curiosity Killed The Cat." Any operating system is vulnerable and to think otherwise is extremely naive. The only reason Windows gets attacked so much is because everyone uses it. What's the point in making an OS virus? This public announcement looks about as wise as bleeding in shark infested waters. With wikileaks serving up american classified documents to everyone, what is the real danger here? Also, either we beef up security because this is a serious problem, or we adopt different tactics for declassifying information that doesn't need to be classified. Probably a soldier trying to load a uTorrent program that he downloaded, that came with a lil extra.. Either way, we're doing it to other countries, so we shouldn't be shocked at all. Anyone who thinks we don't have NSA hackers creating viruses is naive. Either way we need better protection for the computers... users will always do stupid things.. lower their user privileges, etc.. I imagine we will be hearing more such stories. It's a great way for our Government to put many more restrictions over our Internet Freedom here in the U.S. To bad too.